This set of Network Theory Question Bank focuses on “Open Circuit Impedence(Z) Parameters”. 1. Two ports containing no sources in their branches are called? Explanation: Two ports containing no sources in their branches are called passive ports; among them are power transmission lines and transformers. 2. Two ports containing sources in their branches are called? Explanation: Two ports containing sources in their branches are called active ports. A voltage and current is assigned to each of the two ports. 3. In determining open circuit impedance parameters, among V1, V2, I1, I2, which of the following are dependent variables? Explanation: In determining open circuit impedance parameters, among V1, V2, I1, I2; V1 and V2 are dependent variables and I1, I2 are independent variables i.e., dependent variables depend on independent variables. 4. In determining open circuit impedance parameters, among V1, V2, I1, I2, which of the following are independent variables? Explanation: In determining open circuit impedance parameters, among V1, V2, I1, I2; I1 and I2 are independent variables and V1, V2 are dependent variables. Independent variables are the variables that do not depend on any other variable. 5. Which of the following expression is true in case of open circuit parameters? Explanation: The expression relating the open circuit parameters Z11, Z12 and currents I1, I2 and voltage V1 is V1 = Z11I1 + Z12 I2. 6. Which of the following expression is true in case of open circuit parameters? Explanation: The expression relating the currents I1, I2 and voltage V1 and open circuit parameters Z21, Z22 is V2 = Z21I1 + Z22 I2. 7. Find the Z – parameter Z11 in the circuit shown below. Explanation: For determining Z11, the current I2 is equal to zero. Now we obtain Zeq as 1+ (6×2)/(6+2)=2.5Ω. So, Z11 = 2.5Ω. 8. The value of Z21 in the circuit shown in the question 7 is? Explanation: V2 is the voltage across the 4Ω impedance. The current through 4Ω impedance is I1/4. And V2 = (I1/4) x 4 = I1. So, Z21 = 1Ω. 9. Find the value of Z12 in the circuit shown in the question 7. Explanation: The current through vertical 2Ω resistor is = I2/2. So, V1 = 2 x (I2/2). On solving and substituting we get Z12 = 1Ω. 10. Determine the value of Z22 in the circuit shown in the question 7. Explanation: Open circuiting port 1, we get V2 = I2((2+2)||4) => V2 = I2 x 2 =>V2/I2 = 2. Therefore the value of Z22 is 2Ω. 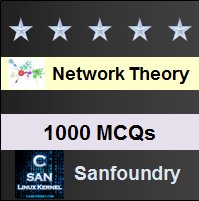 To practice Network Theory Question Bank, here is complete set of 1000+ Multiple Choice Questions and Answers.